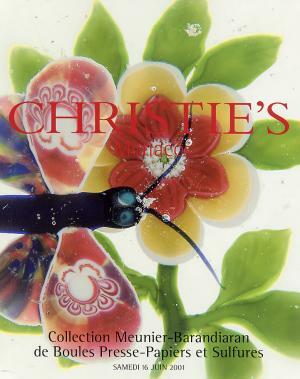 Christie's "Collection Meunier-Barandiaran Paperweight Catalog"
Christie's "Collection Meunier-Barandiaran de Boules Presse-Papiers et Sulfures"
Fabulous catalog from Christie's recent sale. This sale included 221 lots of paperweights and paperweight related objects plus two lots of paperweight literature. There is a color picture of every lot except the two lots of literature. A few lots are also featured in closeup detail photos. The collection included an incredible selection of very high quality European paperweights and related objects. There are approximately 170 outstanding paperweights. All but a few are from the French glass houses of Baccarat, Clichy, St. Louis and Pantin. 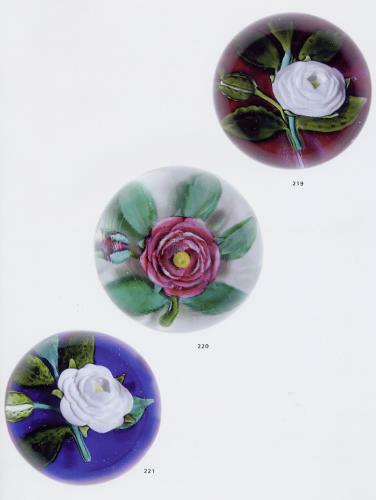 The larger picture (click on the picture to the right) features the three Pantin rose paperweights in the auction. This is a "must-have" catalog for every paperweight collector. The catalog is in as-new condition. It includes the prices realized for each lot. Two lots tied for the highest price of the auction. A Clichy Convolvulus weight and St. Louis upright basket weight each sold for FR 152,750 ($19,857.50). This was a very strong auction with investment quality paperweights. There were a number of extremely rare items in the auction. 8 1/4" by 10 1/2". Soft bound. In French with titles repeated in English. The pictures are multilingual and need no translation. Click on the picture to see a color plate from the catalog.